Are you interested in learning…? Tips and techniques to deal with difficult situations. About the applications of these skills to your business or workplace. If yes, then this course will give you a sound foundation for your facilitation practice. 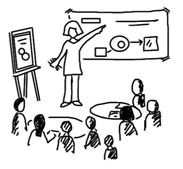 After the full-day course, you will be able to build your facilitation practice: design your facilitation as a skill set; connect to networks and support for your on-going learning in the future. facilitation skills to the next level. to a plethora of resources and websites. and good practical skills to move forward. strategies and techniques for dealing with difficult situations. Thank you, I have lots to think about and include in my planning for Aurukun. to gain more experience in this area. What does facilitation have to do with my business? If you work with others – groups, communities, businesses, executive managers, teams, peers, mentees – Michelle can show you how you can get the most out of your collective time and ensure your outcomes through adopting sound strategies and techniques in your approach.